This is the story of how a city-boy, who never thought much about horses, went from one horse boarded at a nearby barn to a cowboy with four horses living in the back yard. How the heck did that happen!? One of the best things about having horses in the back yard is looking out the window and watching them run around for no apparent reason or finding one of the girls doing something with the horses. I looked out the back window one summer evening and I found this. Kira is reading something from her journal to Beamer. He does not look overly impressed. One of the "perks" of being an owner in White Division is that we get to represent Westernaires in parades. There are about 5 parades any given summer for white division and one for Crimson and Royal in red division. And I just realized I did a terrible job of taking pictures! Oh man, am I ever going to be in trouble with Grammie! Oh well, here is my Trailblazer in her first parade for Westernaires. That's it. No more for this post! I'm telling my self that short and sweet is good. Now that I am done ranting about colic, its time to get back to getting things back up to date. That starts with Westernaires show in Estes Park at the end of June. The first day of the show was sunny and hot. There was the usual hustle of teams and volunteers work in carefully choreographed chaos to get all of the riders into and out of the arena safely. I love the colors of fall. I love the cool weather and the smell of the autumn air. The crunch of leaves underfoot and pumpkin spice lattes. That is all wonderful. What is not so wonderful is the weather can raise havoc with the horses. On October 5th we were at Westernairs. Beamer was just going into the Crimson ride when Kumi asked if looked okay. She said that he was looking at his ribs and didn't feel quite right. He looked okay so I told her to ride him for warmup and see how he did. As she rode off one of our friends came up and asked if I was Boyfriend's daddy. I said yes and then she said those words horse owners across the world hate to hear, "Your horse looks like its colicing at the trailer." Off to the trailer we go and sure enough, Boyfriend is in trouble. He is kicking at his barrel and you can see that he actually tried to lie down. Since he was tied to the trailer at the time, we are very lucky he didn't get hurt. One thing I have learned about colic is that one of the very best indicators is when the horse's rider says there is something wrong. The horse may not appear to be in any distress at all and may even have stomach sounds but the rider knows. This is the kind of thing you only learn from experience and that means I have had a lot more experience than I would care to have. We lost a horse at Estes Park this year to colic and the only real sign we had was that the rider said the horse wasn't right. Since Kumi said her horse wasn't right, I figured I had better be safe than sorry. SO off I run to the arena where Kumi was riding and pulled her out of the ride. I had the instructor call a halt-ho and all the girls started looking around to see who had fallen off or wasn't ready. The instructor told Kumi to leave and she headed for the gate. We get back to the trailer, unsaddle and load the horses. We dumped out half a bucket of water for each horse as we cleaned up around the trailer and headed for the vet. When we get there we took both horses in. Both horses were dehydrated and impact coliced. Damn. So we tube both horses and head for home. We locked them in stalls for the night and monitored them and, I am happy to say, they were both fine the next morning. Catch colic early and the odds of survival go way up. Sidebar: Five horses colied that day at Westernaires due to a change in the weather. You may be asking your self how one little incident of colic makes me hate fall. Well, Sunday and Monday and Tuesday were fine. Wednesday we took Beamer and Kumi to have senior pictures taken. Absolutely beautiful Colorado fall day. Blue sky, trees dressed in green and yellow and red and brown and unusually green grass. That would be thanks to the storm that came through in early September that resulted in all the flooding. It dumped a lot of water and all the lawns are as green as spring here in late October. Senior pictures went great. Thursday morning I went out and Beamer would not eat. Oh oh. Never a good sign. He would take a bite and listlessly munch and then wonder off. Quite stomach sounds to boot. So I load him in the trailer and head to the vet. I was waiting for them when they opened. Sure enough, B was dehydrated and impacted. I was a bit surprised since during pictures, he ate a bunch of green grass. That usually has the opposite effect and makes him really loose. So they tube him and I take him home. Thursday night we go out to feed. B still wont eat. Stomach sounds are still quite so back to the vet, emergency visit this time. Still colicing so they tube him again and we discuss whether or not to leave him overnight on IV fluids. Hard decision but we decided not to leave him. He seemed a bit better. Wake up Friday morning expecting to see a happy horse. Instead, end up loading him back in the trailer and heading to the vet yet again. This time there was no discussion, we hooked him up to the IV and prayed. It terrifies me when you have a horse end up on IV fluids. It really is a coin toss as to whether or not they will pull through. All you can really do is pray. It was hard for Kumi that night. She was out feeding the rest of the horses and her baby was not there. Tears were involved in that feeding and who can blame her. Her horse knows her and comes to her when she calls him. Saturday morning dawns bright and sunny and we load up and head off to Westernaires. What else would we do on a Saturday. I got a call from the vet saying that B was doing great. He was pooping again and each pile was getting wetter so his hydration levels were improving and that we could pick him up in the afternoon. Thank the vet and praise God. You could see the relief wash across Kumi's face when I told her this news. She was ecstatic. We pick up B and took him home with us and began the long process of returning him to normal feeding patterns. We had to do two bran mashies a day for 3 three days followed by three days of one mashie. We also had to feed him every two hours for those first three days which was a real challenge. We didn't get much sleep and we had to come home from school or work to feed and water him. It took a week and a half but he is fine now. He is healthy and he would have a nice shiny coat if not for the fact that it snowed lightly the other day and he had a great time rolling in the mud. With annual show this weekend, I am wondering when we will get to bathe him. I was thinking back to Wednesday night before Beamer coliced wondering what would have caused him to colic again. Kumi frequently lets Beamer into the barn while she is feeding. He is well behaved enough that he is the only horse we can let in and know he wont trash the barn by pulling down bales of hay. He stands quietly and nibbles at the hay on the floor. On Wednesday he was investigating things and knocked over the bag of wheat bran. Kumi stood it up right away and Beamer ate what had spilled onto the floor, maybe a quart. But that wheat bran is so dry I wonder if it sucked all the water out of his stomach and digestive track as it moved through. It seems to make sense so be warned, keep your dry wheat bran out of reach of your horses. So that's why I hate fall. The weather changes trigger colics which trigger trips to the vet which results in large vet bills. Maybe I'll just go order a pumpkin spice latte and take it to the park where I can enjoy the colors and sounds and smells of fall and rediscover the joys of autumn. Inter-Club was Boyfriend's first show as a Westernairs horse. 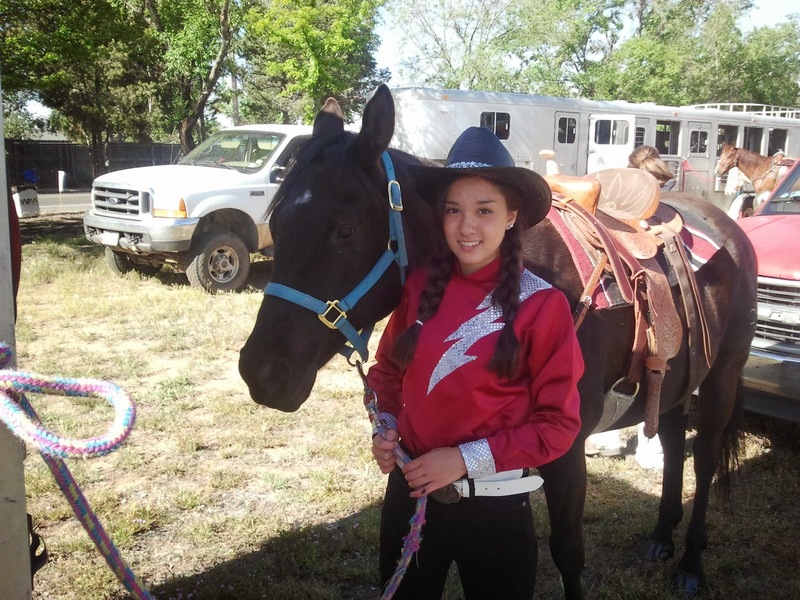 Kira was a the Apache rider for the show. Each Westernaires show opens with a grand entry. 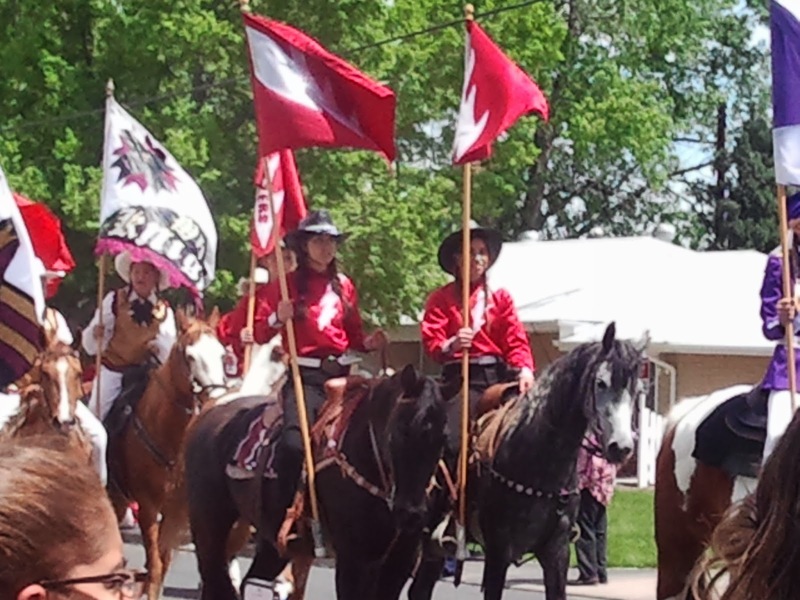 The grand entry team rides in with Colorado and American flags and and the leads the riders that will be in the show through a serpentine line. There can be over 100 horses with their riders in the arena at the same time. When they are all carrying flags, its quite a site. For inter-Club there are no flags. Once the serpentine line leaves the Grand Entry team presents the colors and we sing the National Anthem. The team is dismisses and the last one out is the Apache Rider riding hippodrome and her two out riders. Here is Kira in her exit. I was born and raised in the Denver metro area and am pretty much a city boy. I have a Bachelors and Masters in Electrical Engineering and I work in the power industry. I now have horses. What else do you do when the grass is gone and its sunny! Copyright Cityboy with Horses. Watermark theme. Powered by Blogger.